The National Weather Service is pretty sure we’re going to see snow Sunday, enough to measure and maybe even shovel in fact. The latest, local NWS forecast calls for 1 to 3 inches of snow for our area. 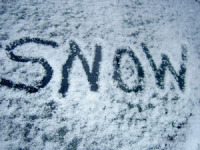 Snow is most likely to fall from about 9 a.m. to 4 p.m,, Saturday. As you might guess, the temperature for Sunday also will be more winter-like, with a high of 35. The good news is temperatures are expected to rise sharply starting Monday morning and reach a high of 49. Highs should be in the 50s and 60s the balance of the week.